A similar effort to Overnight Sensation from two years earlier, Snake Bite Love offers another eleven tracks, and again that's at least three too many. Motorhead still sparkle in brief patches, but are all too ready to package and release a lot of numbingly routine material devoid of any originality. When they are willing to take risks and step outside their zone of comfort, Motohead can be sublime. Dead And Gone, placed as a centerpiece in middle of the album, is a magnificent track, building from an eerie slow intro into an explosive chorus, Lemmy pulling off vocals that sound as if they are indeed coming from the grave. Also notable on Snake Bite Love is opener Love For Sale, a jaunty salute to working girls that benefits from a sustained rock 'n roll ethic and energetic Mikkey Dee drumming. Towards the back of the album is Don't Lie To Me, another rock 'n' roll track that proudly rides its honest simplicity, while Joy Of Labour reaches for and touches a dark industrial machinery sound, with Lemmy delivering terrific vocals and a story of doom. Closer Better Off Dead lives and dies by a wondrous fast riff, since the track built around it can't keep up. 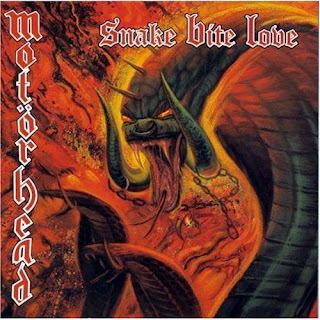 A lot of the rest of Snake Bite Love is Motorhead on auto-pilot, churning out music with eyes closed and inspiration sadly missing. Produced by Howard Benson. Recorded and Mixed by Mark Dearnley.